We have a ton going on this week. 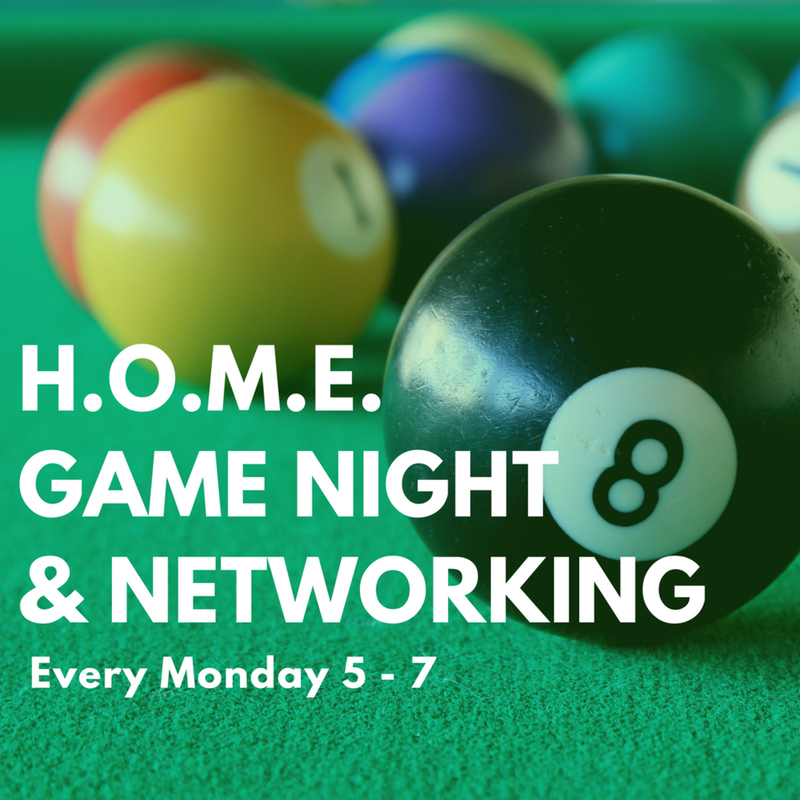 Monday, we'll be hanging from 5-7 for Game Night, Tuesday is the Artist's Circle with Wendy Parr, Wednesday is the CD Baby Live Podcast & Happy Hour, Thursday there's a Chamber of Commerce Networking Workshop in the rec hall, and Saturday our Legal Mentor, Colin Maher will be setting up shop in the Homie's lounge for his in-home Mentoring Hours. Be sure to check out the details about each of these events down below. We want to know more about all of you, your music, your work, your company, current projects etc. If you'd like to be a featured HOMIE, please click the link below to let us know and we'll contact you soon for an interview. It's going down every Monday from 5-7pm. BYOB and come on out for some friendly competition and networking. Billiards, ping pong, shuffle board, darts, giant Jenga, board games, and more! All Homies and their guests are welcome. Got new music you wanna share? We'll "Pass the Aux Chord" and let you showcase your latest masterpiece to the game night audience. In-Home Mentoring Hours, 10-2 on Saturday, May 19th. Schedule a meeting with Colin to ask him any general questions you have about the legal side of the music industry. From band agreements, copyrights, trademarks, record deals and publishing splits, there is a lot to learn and be aware of. Signup for a session HERE, and pick his brain about entertainment law. HOMIES! Check out the Artist Circle taking place at HOME this Tuesday! The Artist’s Circle is everything for the creative spirit – mind, body & soul. At this event, musicians, vocalists, songwriters, and producers at all stages of their careers come together to grow, get community support, and transform their careers. HOMIES get 25% off - code can be found in discounts section of the online member portal. Nashville Creatives - this is your opportunity to connect, be inspired & build your team. Successful people have learned how to make networking a critical and even favorite method to build business. Others without system, strategy, goals or techniques find themselves frustrated, wasting time trying to sell to people who will never buy and unprepared for important connections. It can bring feelings of stress, fear, and negative attitudes towards networking. This fun session will provide a strategic system for developing relationships. You’ll learn to differentiate yourself from the competition. Generate interest in you and your business, and learn the dos and don’ts. You’ll take away a customized plan and practice to reduce stress, increase confidence, and become more comfortable with networking. This will be the start of putting your plan into action.